Cloudy, with intermittent showers today. 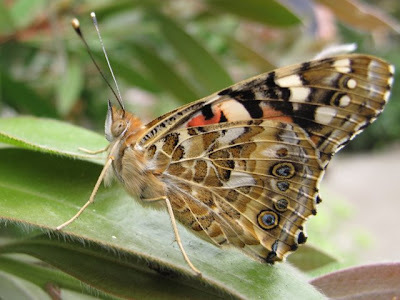 A cold Painted Lady sat 'shivering' on a bush in the garden and allowed me a close approach. The shivering appearance was due to the butterfly revving its flight muscles, what I had never seen before. I have to apologize - to the butterfly - that I had to use flash, as it was dark and I wanted to emphasize the effect of its wings movement. A few moments later, the butterfly flew away. 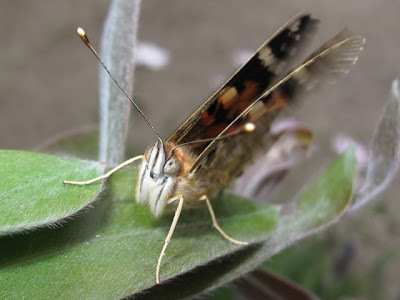 A view of the Painted Lady's wing underside. On this frontal shot the first modified pair of legs are visible just under the butterfly's eyes.